This will be an easy hour on the flat bike path to spin the legs and make sure the bikes are working properly and set up correctly. Directions are not needed for this ride. It will be an out and back ride. ​Be sure to look around on this ride! Our week begins with a relaxing ride along a flat bike path before heading up the quiet and charming roads to Col d'Epine, a 7 km climb with grades of 7-10%. The second half of our loop will be around lac d'Annecy with a coffee stop in the beautiful town of Annecy for some people watching. The ride options today all begin up the Col de Leschaux, a 12 km ride up, but with gradients averaging 4%. The twists and turns take you up in to the forest and through landscapes rich in wealth and beauty. There are 2 route options today, epic and more epic! 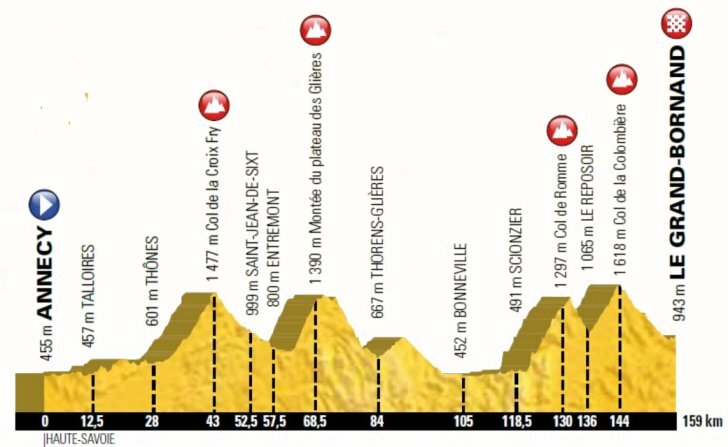 The shorter route includes part of stage 12 of the 2018 Tour de France with the Lacets de Montvernier, a gem of a climb at 4 km long, with 18 switchbacks ranked one of the most beautiful climbs in the world. Our love affair in the Alps will continue up to Col du Chaussy, offering some of the most amazing views of the week as we enjoy a sweeping descent from there to the start of the Col de la Madeleine. Riders can choose to turn right and summit the Madeleine or turn left and finish their ride. ​Clara Hughes has named the ride around Lac d'Annecy as one of her favourites. Today is a recovery ride, with a flat ride around this gorgeous lake. Mostly on bike paths, or quiet roads, there are many opportunities to enjoy the diversity of the towns on the shores of the glistening water. Looking for a bit of a challenge? Then enjoy the optional 11 km climb up the Col de la Forclaz for some really spectacular views of Lac d'Annecy. We will take a rest on one of courtyards in Talloires, overlooking the intoxication blue waters. ​Sporting some of the best views of the surrounding mountains and Lac d'Annecy, the climb up le Semnoz offers many rewards. Featured as the penultimate finish of the Tour de France in 2013, today you will have a chance to tackle this friendly giant from all three sides. Get in to a rhythm and enjoy the twists and turns through the forest before the panoramic views stun and amaze with Mont Blanc.